Asalamualaikum and peace be upon you. If you are looking for a passive income generating program every day, you are now in the right site. Prior to that, let us introduce our background, and a little introduction about this program. We are a number of entrepreneurs based in Malaysia. Over the last few years, we've got news that Bitcoin's price has risen so high. We do not need to make any clarity about what Bitcoin is because we believe people in the country are IT literate and know the existence of this new kind of currency. If you are new and want Bitcoin information, we recommend that you get the information through Google's search page. Therefore, we do not want to miss this golden opportunity. Through our share capital, we have successfully built a Bitcoin mining and trading center. Initially we only run Bitcoin's mining and trading operations on a small scale. Within a few months of our mining and trading operations, we are only able to earn too little profit and are not worth it when compared with our time and cost. Due to constraints in terms of capital, we are unable to generate higher profits in Bitcoin trading than ever to add a mining machine where the cost of a mining machine is around RM10,000-RM20,000 per unit, and if you want to generate a profit high, we need at least 100 units of mining machinery. This is where our idea is to open this BITZARAPRO program. Starting in October 2017, we launched the program's website to invite anyone who has the capital to become one of our "funders" of our Bitcoin mining and trading program. With this kind of program, we actually realize a "win-win" situation. We can generate profits through mining and trading BITCOIN and you as a "funder" will be paid profits from the amount of capital you spend on our program. We believe this offer is worth the money for both parties. 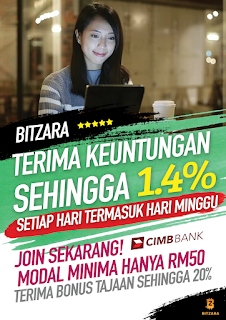 INI PELABURAN TIPU...TOLONG JANGAN JOIN BIZ MACAM INI.